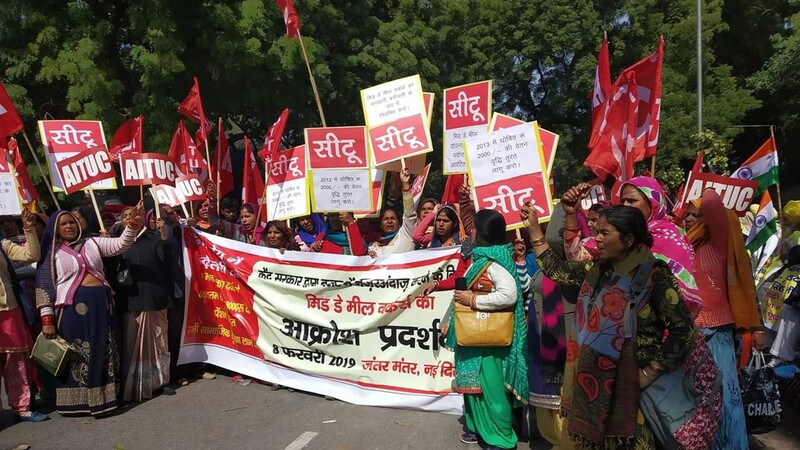 Hundreds of women poured into the streets against the Modi government’s betrayal of promises and in solidarity with their protesting Bihar colleagues. Mid Day Meal Workers Protest at Jantar Mantar, New Delhi. New Delhi: Chanda, a dalit woman from Mewat, wept while remembering her husband who died in 2011. She has been taking care of her two daughters and a minor son since then. Chanda works as a mid-day meal worker at a government-run primary school in Haryana. Today, for the first time, she joined hundreds of her fellow mid-day meal workers to protest against the “anti-worker” policies of the Narendra Modi government at Jantar Mantar, to raise their demands and in solidarity with 2.48 lakh mid-day meal workers from Bihar who have been on an indefinite strike since January 7. Nearly 26 lakh workers, mostly women belonging to backward sections, are employed in the mid-day meal programme, which was designed to provide nutritious meals to crores of school-going children. The mid-day meal workers work at least 6-8 hours every day and are yet not recognised as workers. They are paid a pittance of Rs 1,000-2,500 a month and that too for only 10 months in a year, devoid of any social security. - Increase in remuneration up to minimum wages. The workers accused the Modi government of trying to privatise the mid-day meal scheme by handing it over to the corporate NGOs. “There is a close nexus between the corporates and government. Corporates like Nandi Foundation, Vedanta and others have been roped in,” said Jai Bhagwan, General Secretary of the mid-day meal workers federation. With 2019 elections around the corner, the resistance against the current government is growing at a rapid pace.